I made these cupcakes at the weekend after being inspired by Lola's cupcakes in Selfridges! This recipe makes 24 cupcakes. To make the cupcakes, preheat the oven to 350 degrees. Line two cupcake pans with paper liners. In a medium bowl, sift together the flour, cocoa powder, baking powder, baking soda and salt; set aside. In the bowl of an electric mixer, beat the butter on medium speed until smooth. Gradually add the brown sugar and continue beating until fluffy, scraping down the sides of the bowl as needed. Beat in the vanilla. Add the eggs one at a time, beating well after each addition. With the mixer on low speed, add the flour mixture in three additions, alternating with the buttermilk, beginning and ending with the flour mixture. Mix just until all the dry ingredients have been incorporated, being careful not to overmix. Divide the batter between the prepared cupcake liners. Bake until a toothpick inserted in the center comes out clean, about 18-20 minutes. Transfer the cupcakes to a wire rack and let cool to room temperature. To prepare the frosting Icing, beat the butter till soft, then add the sugar and mix. Add milk and vanilla and keep mixing. Add the crushed Oreos and mix. 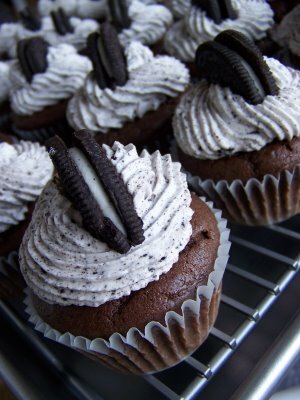 Top the cooled cupcakes with this icing and finish off by placing half an Oreo cookie on top. There's mention of buttermilk, cocoa powder and brown sugar in the method but these aren't listed in the ingredients whatsoever?